You know how you’ll go by the same restaurant every so often and it seems really intriguing and you think, “We really should eat there some day.”? After the twenty-third time or so that my husband and I were in Murfreesboro, Tenn., and walked by the Maple Street Grill, downtown on the square, we finally decided to go in and, you know, eat. Turns out that Maple Street is a popular local gathering spot for lunch and dinner as well as drinks and tapas at night in the upstairs bar, Maple Street Uncorked. And no wonder. The interior space has that urban-cool feel of downtown renewal without being pretentious about it — it’s cozy, comfortable and Southern elegant all at the same time. The lunch menu was enticing — a grilled portabella sandwich, pan-seared tuna, fish taco and turkey and apple sandwich all sounded yummy. (Not to mention the Fried Hershey Bar. Since I’ve been banned from deep-frying sugary objects at home since our leftover Valentine’s candy debacle, I have to take advantage of anytime I can snag a warm & melty fried delight.) Dinner featured steak, chicken and pasta entrees, while the Uncorked menu included tapas choices such as a hummus flight and a cheese board along with I-really-want-to-try-that drinks — Cucumber Rain, made of Rain Organic Cucumber Lime Vodka with sweet-and-sour mix and ginger ale, seemed especially to be calling my name. Extra points to Maple Street, too, for online ordering and a smart-phone app. We’ll be back. This entry was posted in family, food, friends, shopping, Tennessee, travel and tagged Cook, Deep frying, food, Maple Street Grill, Murfreesboro, restaurants, Sandwiches, Taco, Tennessee, travel, Valentine's Day by Coffee with Cathy. Bookmark the permalink. 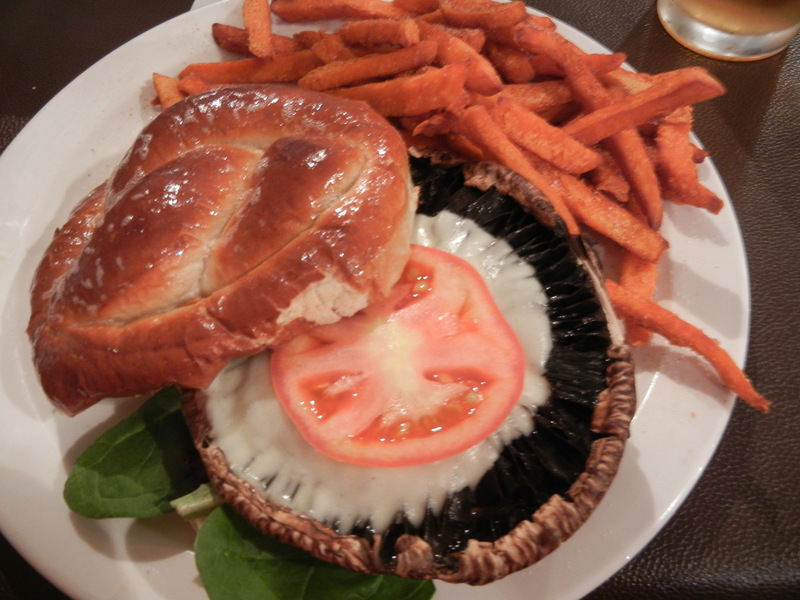 I was confused by the “pretzel bread” on the menu for my portobella mushroom sandwich.but it turned out to be a sort of soft-pretzel-like roll instead of the bread with little pieces of pretzels in it that I’d envisioned. Or two hard, flat wafers. But that seems to be a food trend … “bagel bread,” “goldfish bread,” etc. You are so correct, sweetie. Although nobody seemed as delighted with the Goldfish bread (which is bread shaped like the Goldfish crackers and not … well … you know …) as I was. Even our almost-4years-old grandson was not impressed, while I thought it was marketing genius. But then I thought LSU would win the championship, so what do I know? My favorite item on the menu is the ahi-tuna. I am primarily vegetarian, but ahi-tuna is a real treat. They offer a wonderful ginger-like sauce that make’s it very savory. I have never had bad service at Maple Street. It continues to be one of my go-to fine dining options in the boro. I am the publisher of a local magazine called B.Real Magazine. Check it out http://www.brealmagazine.com. Great review! 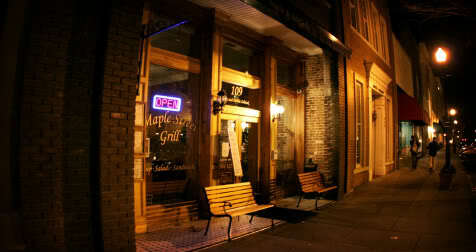 Check out this review of Maple Street Grille! Thanks, Collen. We are big fans of the ‘Boro — my husband’s hometown. Good luck with the magazine. It looks great!